Hey y’all! Happy summer! I love this time of year….Our summer nights are filled with practically living on the back porch, enjoying supper together with family and friends, with ceiling fans offering a cool breeze — all while enjoying God’s beautiful, green earth and the little flashes of lightning bugs, late sunsets, popsicles and lots of laughter! I could go on and on about all the wonderful reasons I love summertime! 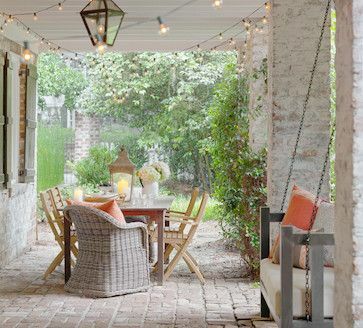 And I don’t know about you, but lately, I’ve really enjoyed looking at all the inspiring photos of outdoor spaces on Pinterest and decorating magazines. 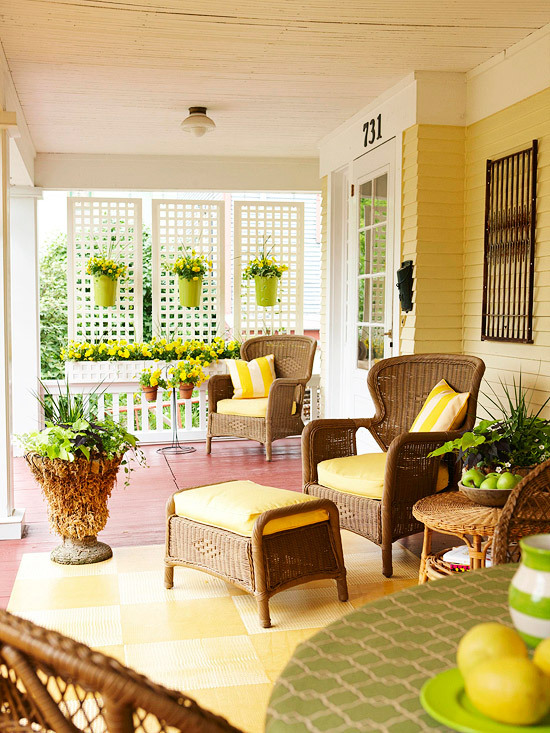 So, here are a few tips to creating a cozy patio or porch that’ll be uniquely yours! And included are some gorgeous, inspiring spaces that I’m loving at the moment! 1. 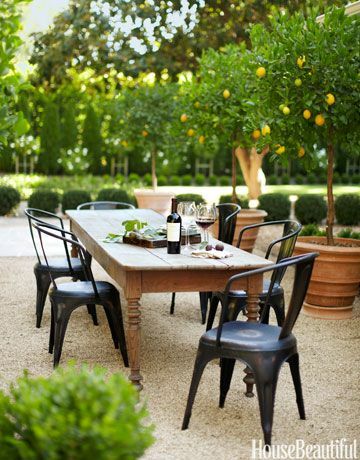 Decide what it is that you’re going for….basically, an outdoor living room or an outdoor dining room? In other words, do you want couches and swings or a table and chairs for your main seating area? 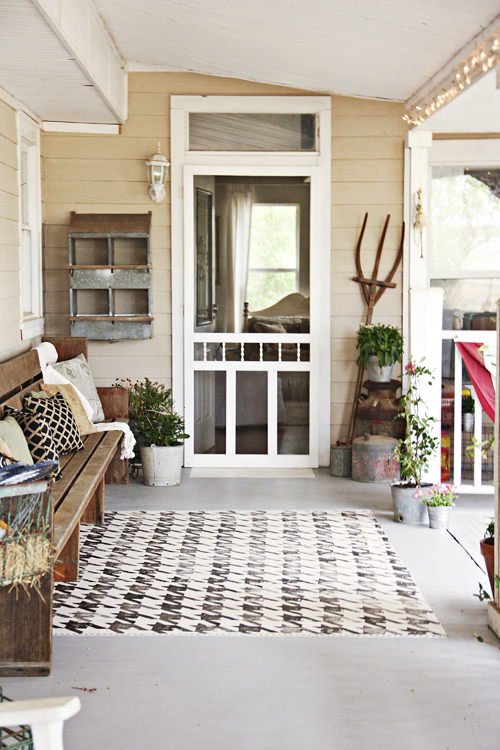 Either option is great for a patio — or even your front porch! I’m totally loving the lattice dividers hanging from the ceiling! 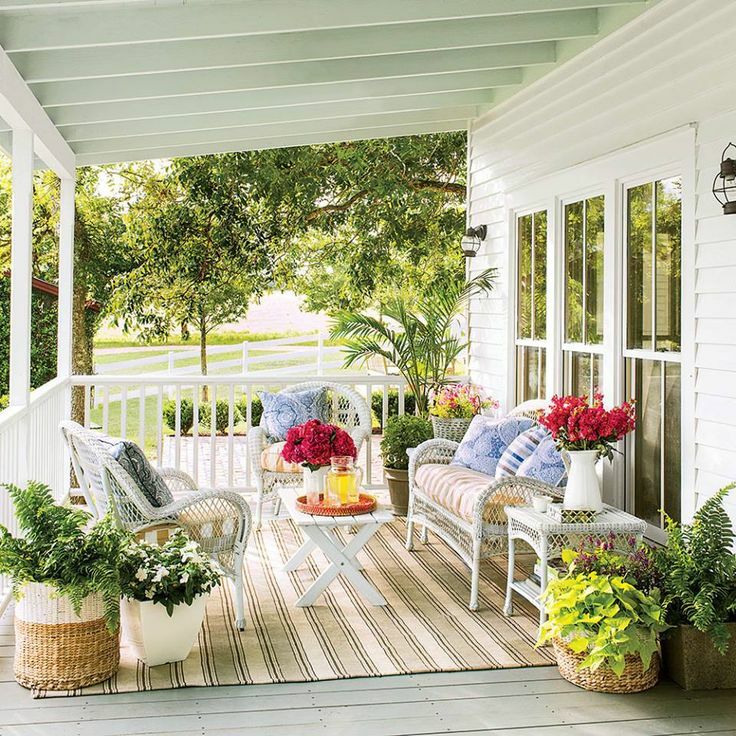 It gives both a sense of privacy, along with a punch of interest on this classic porch. 2. 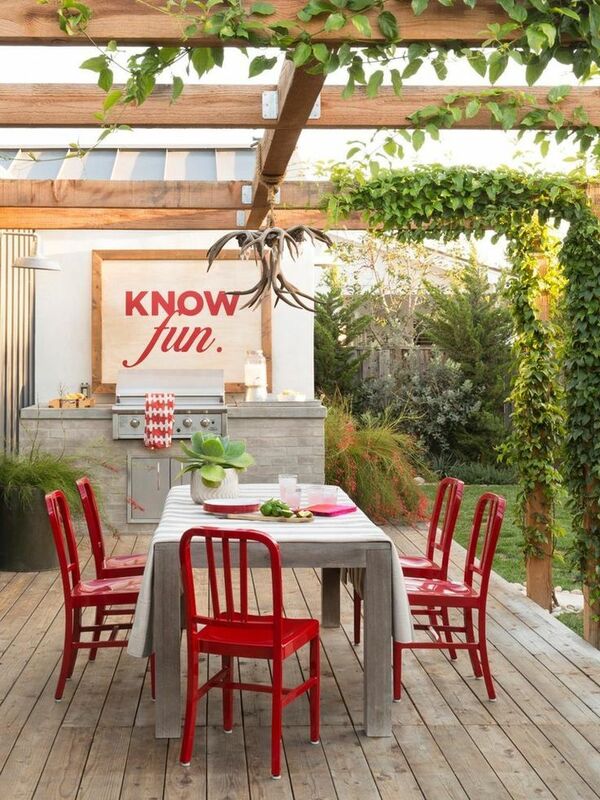 Once you’ve decided what type of outdoor room you’d like to set up, create a budget and stick with it! Three easy ways to keep from over-spending (preaching to the choir here) — shop your house, shop second-hand (e.g. yard sales, thrift stores and your mama’s attic! ), and do as much of the diy-projects yourself as you can! (For my tutorial on a thrifted dining table and chairs, click here.) You can do it! In the above pic, the owner created a cohesive look by painting all the mismatched chairs the same color. A very easy and super-economical way to decorate, not to mention totally fun! 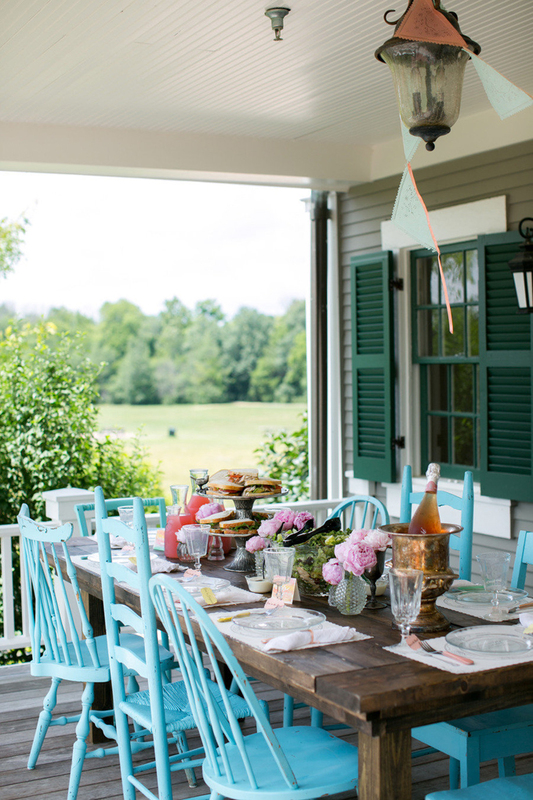 And don’t you love the hanging banner, fresh peonies and vintage containers?! 3. Before you start shopping, search Pinterest, decorating books and magazines, and other inspiring sources for ideas on figuring out your furniture placement. Always consider the scale of your space and the scale of your furniture. You don’t want to have a large space with lots of small furniture pieces. Visually, the room will look too cluttered. Yikes! 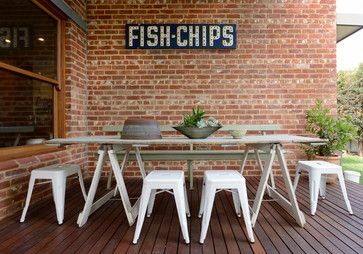 Love that sign (in the above picture), but don’t know how to hang something similar on your brick wall? Here’s an awesome, inexpensive item to use!! Observe (in the pic above) how the tablecloth is folded on the edges. Just something different! I placed these beautiful flowers in an old galvanized mopping bucket that was just sitting around in our garage! The vintage bar cart was a $5 yard-sale purchase. The Cracker Barrel rocking chairs add a cottage-feel, while the pair of white 98″ H & M drapes ($10/pair) are tied back with fun, nautical rope from Michael’s. 4. After you’ve taken care of your furniture, the next step is to focus on accessorizing. (My favorite part!!) Fun accessories to consider are string lights, drapes, a rug, lanterns, candles, galvanized wall decor, and flowers. On a side note, drapes are always a good thing! You can find super-inexpensive white drapes at places like Ikea ($10 for a PAIR of Vivan drapes)….Or, you could get a little creative and grab some white twin, flat sheets at Walmart. They’re super-easy to keep clean! Also, string lights add such a soft ambiance to your space….I’m not talking about Christmas lights. I’m talking about Edison bulbs or the round bulbs — something like this. They are always at Target at the end of the season at 75% off (or more)! Several sets can add up, so if you want to save a little cash, hold off til the end of the summer, so you can grab lots of ’em! Notice the drapes, the potted flowers, the painted stairs, the greenery, candles, colorful pillows and the rug. I especially love the olive bucket. It doesn’t have anything in it, from what I can tell, but its purpose is to simply add prettiness. Don’t you love a little pretty?! 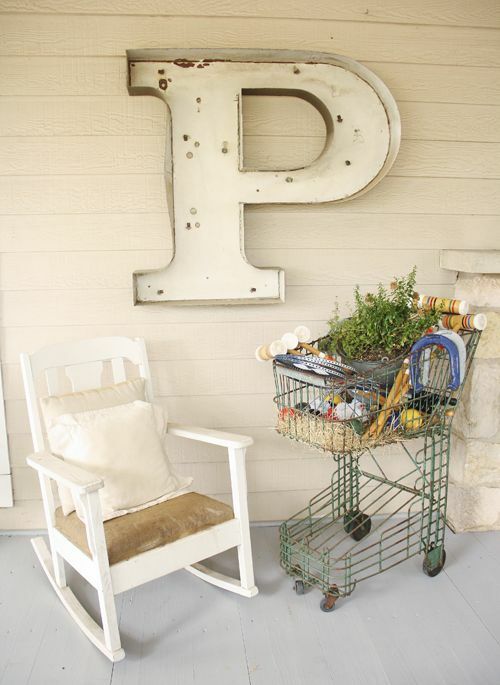 Loving this over-sized antique monogram! It’s a stop-you-in-your-tracks kind of wall art! Notice how the string lights are hung in the above pic. I love that “effortless” look. 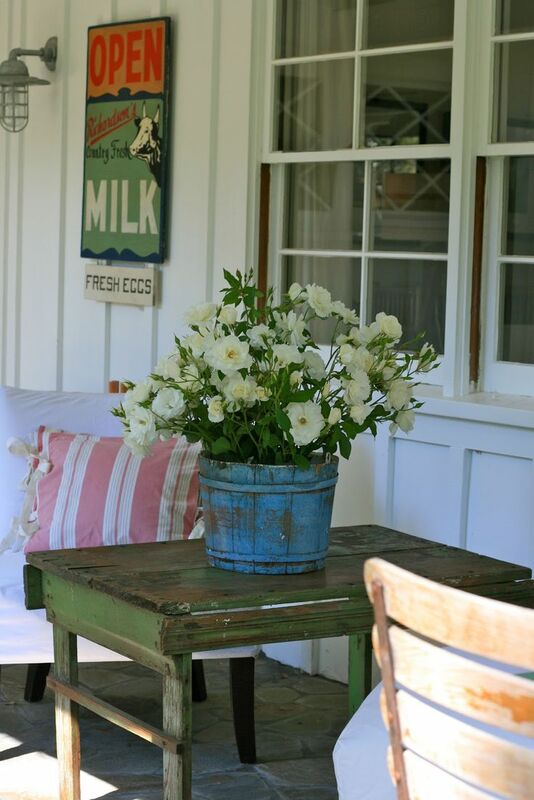 How fun is this vintage bucket filled with beautiful flowers, the lantern, the white cushions and the eye-catching sign?! If you love the look of a rug, but don’t want to pay for a rug, there are other ways to get around it. “Necessity is the mother of invention.” Right? 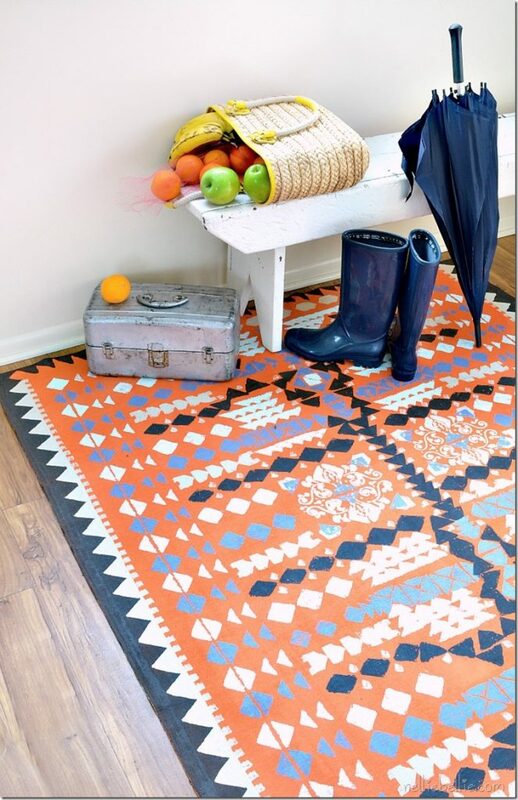 You could do a faux rug by painting a design onto your floor, like this one in the pic below. 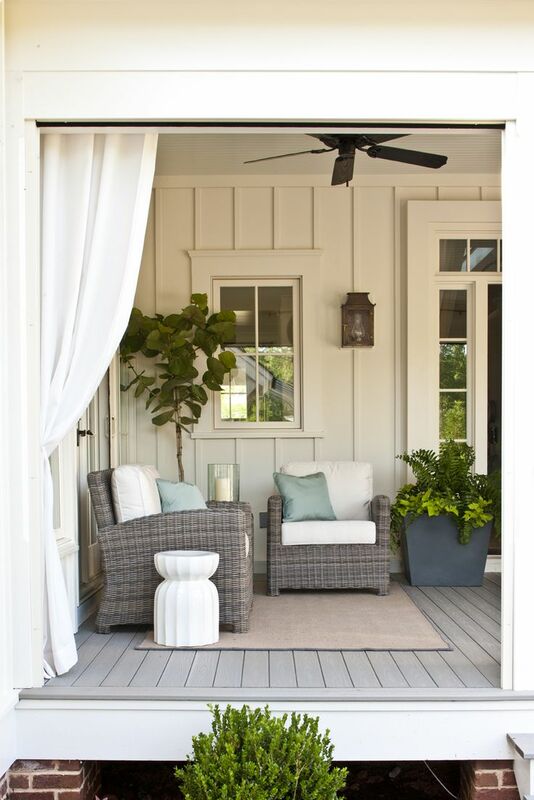 I hope this post has inspired you to shop your house, and create a beautiful living space outdoors that’s uniquely yours! 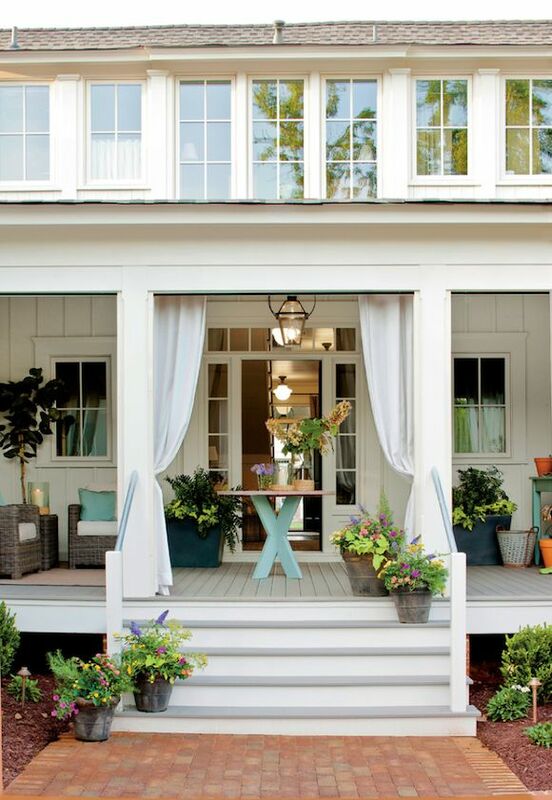 What are your plans for your summer porch or patio? Are you hanging string lights this year? Adding fresh flowers? Whipping up some colorful handmade pillows? I’d love to hear about it and see photos! Your pics inspire me! 😉 Comment below, or stop by and say hey on Pinterest, Instagram, Twitter, and Facebook. It always makes my day to hear from my sweet readers! Very summery! Get’s me going!! Yay! Thank you for your sweet comments! Hugs! I simply want to say I am just new to blogs and seriously liked your web-site. Probably I’m likely to bookmark your blog post . You really have good writings. Regards for sharing your blog site. Hey! I know this is sort of off-topic but I had to ask. Does operating a well-established website such as yours require a lot of work? I am completely new to operating a blog but I do write in my journal daily. I’d like to start a blog so I can share my personal experience and feelings online. Please let me know if you have any recommendations or tips for new aspiring blog owners. Thankyou! Hello! Quick question that’s totally off topic. Do you know how to make your site mobile friendly? My blog looks weird when viewing from my iphone4. I’m trying to find a theme or plugin that might be able to correct this problem. If you have any recommendations, please share. Appreciate it! Hmm it seems like your site ate my first comment (it was super long) so I guess I’ll just sum it up what I had written and say, I’m thoroughly enjoying your blog. I too am an aspiring blog writer but I’m still new to everything. Do you have any suggestions for inexperienced blog writers? I’d genuinely appreciate it. Good day! I know this is kinda off topic but I’d figured I’d ask. Would you be interested in exchanging links or maybe guest writing a blog post or vice-versa? My website addresses a lot of the same topics as yours and I believe we could greatly benefit from each other. If you’re interested feel free to shoot me an email. I look forward to hearing from you! Superb blog by the way! Thanks for your marvelous posting! I really enjoyed reading it, you happen to be a great author.I will always bookmark your blog and will eventually come back very soon. I want to encourage you continue your great writing, have a nice holiday weekend! Please let me know if you’re looking for a author for your site. You have some really good posts and I feel I would be a good asset. If you ever want to take some of the load off, I’d absolutely love to write some material for your blog in exchange for a link back to mine. Please shoot me an email if interested. Thank you! Do you have a spam issue on this site; I also am a blogger, and I was wondering your situation; we have created some nice practices and we are looking to exchange methods with other folks, please shoot me an e-mail if interested. Hello! I’ve been following your weblog for a while now and finally got the bravery to go ahead and give you a shout out from Lubbock Texas! Just wanted to say keep up the fantastic job! Hi would you mind stating which blog platform you’re working with? I’m planning to start my own blog in the near future but I’m having a difficult time selecting between BlogEngine/Wordpress/B2evolution and Drupal. The reason I ask is because your design and style seems different then most blogs and I’m looking for something completely unique. P.S My apologies for being off-topic but I had to ask! Great post however , I was wondering if you could write a litte more on this subject? I’d be very thankful if you could elaborate a little bit further. Bless you!